The Rodrigues Fody was formally described by Alfred Newton, an English zoologist and ornithologist. The Rodrigues Fody had been collected by Edward Newton, the younger brother of Alfred, and a British colonial administrator and ornithologist. Alfred and Edward had obtained specimens of the Rodrigues Fody some 20 years earlier from John Augustus Lloyd, an English engineer and surveyor, who worked in Mauritius from 1831 - 1849. The Newton brothers thought the birds brought by Lloyd were flavistic Red Fodies. In November 1864, Edward visited Rodrigues Island and soon shot a Rodrigues Fody and recognised it as the same species as the Lloyd specimen. Edward noted that the species was very common, and he saw a flock of at least 100 birds. 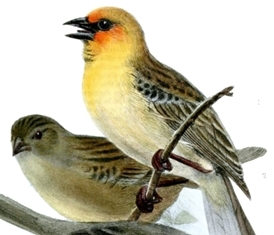 The first illustration of the Rodrigues Fody was of a male and female, published by Newton (1865). 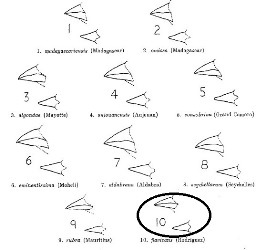 The next illustration pertaining to Rodrigues Fody was of the bill shapes of different fody species by Moreau (1960). Foudia flavicans	Newton 1865	Proc. Zool. Soc. London, p.47	Rodriguez Island. flavicans Modern Latin. flavicans, yellowish, golden-yellowish (L. flavus, golden-yellow, -icans, closely resembling). "yellow bird" (Newton 1865), followed by goldfinch (Leguat 1891). John Lloyd, and Edward Newton. 1846 (Lloyd), and November 1864 and July 1865 (Newton). There are many syntype specimens in different museums, including Cambridge where Alfred Newton was based. Identification. The Rodrigues Fody breeding male has a golden-yellow head and breast, with orange on the forehead to upper throat, and a small black mask; the belly to undertail-coverts are buffy white. The non-breeding male is dull with a yellow wash on the face, and retains the black bill. The female is olive-brown with a black bill. The juvenile resembles the female, but with some yellow on the throat, and a pale horn-coloured bill. Distribution. The Rodrigues Fody has one of the smallest global ranges (5 km2) of any weaver. 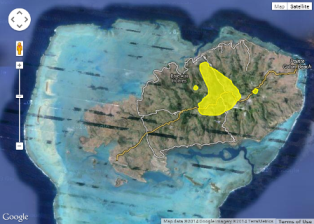 It is restricted to part of Rodrigues Island, Mauritius (see map below, based on Handbook of the Birds of the World, Vol. 15). There are no subspecies of the Rodrigues Fody. 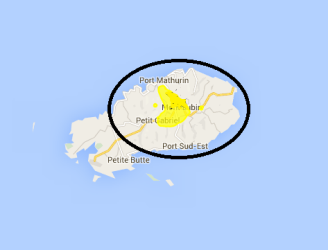 It is listed as VULNERABLE since it is restricted to a single island, on which it has a small population. Historically, it was abundant on the island, but was nearly driven to extinction with only 5 or 6 pairs remaining by 1968 after clearance of natural vegetation and cyclones. Due to conservation efforts its numbers are increasing, following an on-going programme of reforestation. The total population size in 2010 was estimated at 1700 individuals, but this is probably an under-estimate. Habitat. The Rodrigues Fody inhabits remnant natural forest, and also exotic trees and shrubs where these are sufficiently dense. Food. The Rodrigues Fody feeds mainly on insects (including caterpillars and homopteran bugs), spiders, seeds, nectar, and fruit. It has a brush-tipped tongue which is adapted to nectar-feeding. The Rodrigues Fody often forages by gleaning along branches and in the canopy. It is encountered in pairs or family parties, and occasionally in mixed-species flocks. Breeding. The Rodrigues Fody is monogamous and breeds opportunistically. A pair defends its territory of 1000-4000 m2 throughout the year. The nest is oval, with a side entrance and short porch. The nest is roughly woven from grass, and feathers may be used as lining. 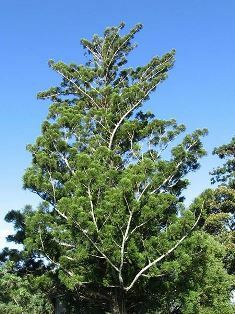 The nest is placed 1.5-4.5 m above the ground at the end of a branch, most often in Araucaria cunninghamii trees. The same tree may be used as a nest site in successive years. The clutch is generally 3 eggs, which are pale blue. Incubation is by the female alone. Both parents usually feed the chicks and remove the faecal sacs. Chicks are fed by regurgitation or with live food. Nests are sometimes destroyed by children.